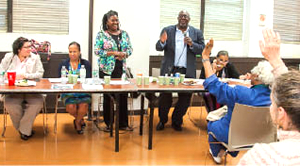 The DC 37 Civil Service Committee holds monthly meetings to discuss civil service issues. Meetings scheduled for the 2nd Wednesday of the month. To insure that the Civil Service System remains a viable and vibrant entity in New York City government. To educate members about their rights under civil service. To inform our members about problems within the civil service system. To maintain civil service regulations and take corrective measures when they are violated. To reduce the number of per diems and provisionals in city service. To ensure that civil service examinations are fair, relevant, and given on a timely basis. To insure that hiring conforms to the current rules and regulations of the civil service system. To increase the awareness of Civil Service Month – October. To provide information and referrals to our members, when appropriate.